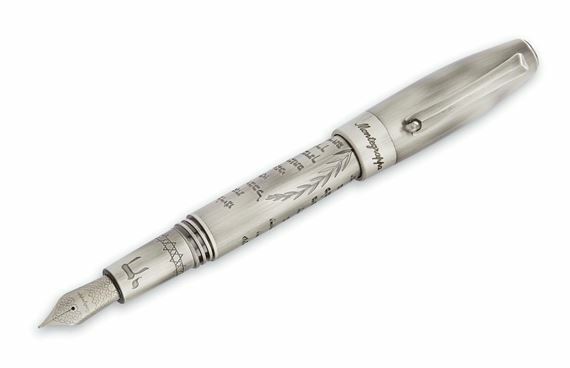 Order your Montegrappa Fortuna Steel Shema Fountain Pen today from FahrneysPens.com. Fine Pens, Refills & Luxurious Gifts – great prices & fast shipping. The Montegrappa Fortuna Credo Shema celebrates the great monotheistic religions that arose from ancient civilizations. Credo Shema Israel pays tribute to the prayer as a part of religious culture. The new Steel Shema is engraved and filled in to give it depth along with the 3 set stones that represent the Star of David. The prayer Shema Yisrael in Hebrew, proclaiming the main idea of Judaism - the unity of God and the union of the Jewish people with God is engraved on the pen. It translates into: “Hear, O Israel, The Lord is Our God, The Lord is One.” On the cap is the Star of David highlighted with three crystal insets. Etched on the grip is the Hebrew word for life and a pattern of interlaced Stars of David; the barrel is engraved with a palm branch, the classic symbol of peace. The fountain pen has a polished steel nib. The collection also includes a capped rollerball and twist ball pen.